Winter is being very gentle this year, approaching in a kind and mild manner. No October snow storms, no real cold weather yet, in fact it has been relatively warm. The smallest elements freeze first on those early cool nights when when the mercury falls below zero centigrade - tiny bits of dew and condensate that collect on leaves on the ground in open areas exposed to radiational cooling. The few remaining leaves still on their plants also get some garland from mother nature. With most of the leaves having abandoned their trees, exposed branches reveal hidden treasures, such as this bird nest left over from last spring's breeding season. I walked by it a hundred times and never saw the clandestine residence. I don't know what bird made this nest, but probably not a robin (too messy) or a chickadee (too large). Maybe a thrush? They were in the vicinity this spring. I saw signs of deer rutting in a concentrated area near the lake, so I set out my camera to see if I could catch a picture of a buck - I have never caught one with antlers. And sure enough, one made an appearance in just a few days. And about an hour later, a doe. 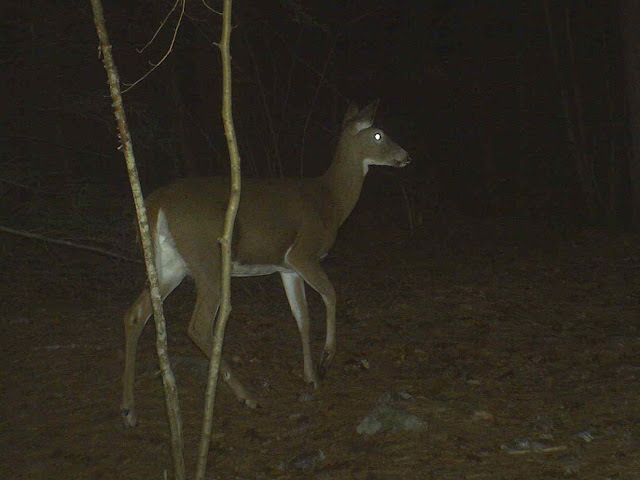 Mating season for White-tail deer in New Hampshire takes place in late November, followed by a 201-day gestation period, resulting in fawns born in early June. I got a second picture of a buck - I don't know if it's the same one, but it looks to have a bigger set of antlers. 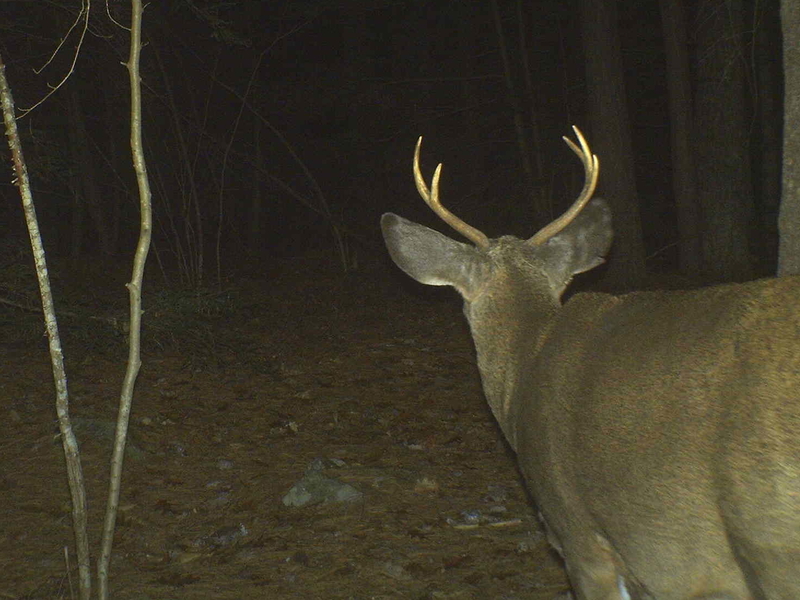 One of the points is broken off - perhaps it has been fighting over territory and females with another buck. Look at the size of its neck! I wonder if this buck sired the fawn I saw back on August 2nd. Male deer grow new antlers ever year in late summer; the size of the antlers being predominantly a function of their food source - abundant food develops larger antlers. By January the antlers will have fallen off and become a desirable food source for small rodents, an unusual twist in the food chain. 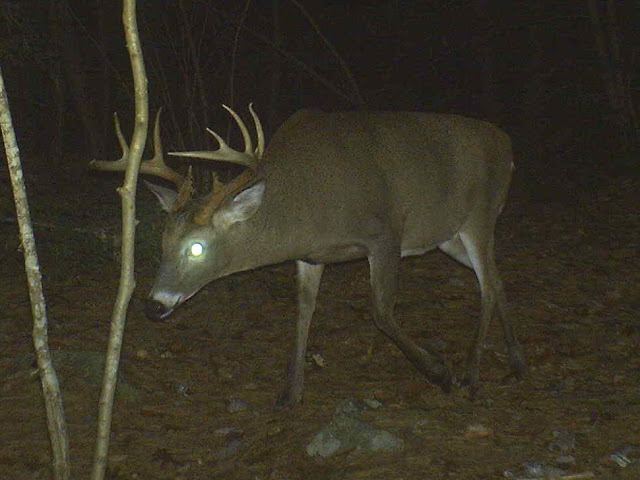 Male deer become aggressive during mating season, losing much of their usual caution - much to the benefit of hunters - and is why relatively more bucks than does are taken each year. These deer were walking along the trail just before a beautiful sunrise, when hunting can commence, (rifle season started on Wednesday), so don't tell the hunters! ; ) And wear your orange!